The market is scheduled to move to a new site in Toyosu in November 2016, so visit it in its original location while you still can. Hop on a train to Tsukijishijo station on the Toei Oedo subway line. From the station, it’s a mere three-minute walk to the market. If in doubt, just follow the hordes exiting the station. For an eye-opening experience (literally, as you’ll have to forgo some sleep! ), check out the market’s live tuna auction that commences in the wee hours of the morning. While it’s open to visitors from 5.25am, we’d recommend reaching the premises by 4am to get your hands on one of the colored vests that will gain you entry — only 120 of these “tickets” are handed out every day. Watch in awe as local fishermen haul in tons of fresh bluefin tuna, and exorbitant bids are made for their prized bounty. Having sushi first thing in the morning might seem odd, but trust us when we say that it’s the breakfast of champions. It’ll definitely fuel you for the rest of the day! If you’re willing to queue for hours on end, join the masses at Sushi Dai (Building 6, +81 3 3547 6797) — arguably the market’s most popular joint. Expect to pay around ¥4,000 for an omakase set, consisting of 10 pieces of sushi and one roll. Another well-known option is Daiwa Sushi (Building 6, +81 3 3547 6807), located just a few steps away. Here, a set of seven pieces of sushi and one roll will set you back around ¥3,500. 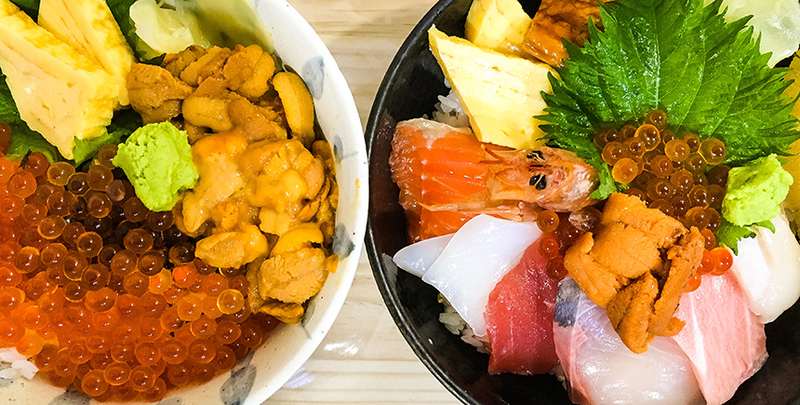 But if you simply don’t have the patience, simply pop into any other shop for a hearty chirashi don or nigiri set. Chances are that whatever you order will still taste better than anything you can find back home. Once you’ve filled your belly, traipse over to the flurry of activity that is the wholesale market. Here, you’ll find locals hurrying from one stall to another, bargaining for the day’s freshest catch. Avoid getting in their way if you can! You’ll find more than just fresh seafood at Tsukiji. Many stalls in the outer market also sell a variety of specialty goods, such as sashimi knives, don bowls, green tea, freshly grated wasabi and more. There are plenty of street snacks to be had here as well, such as piping hot tamago, aburi scallops topped with dollops of uni, and cubes of fresh mochi dusted with matcha powder. Dress right. Covered shoes are a must, especially if you’re planning on attending the tuna auctions. You don’t want to get your feet wet! Bring a small bag. The market’s narrow lanes are sardine-packed with locals and tourists alike, so an unwieldy bag (luggage is definitely a no-no) will just inconvenience others. Be patient. While most wares are priced competitively in the outer market, you’ll sometimes stumble upon steal deals. Navigate the warren of little streets patiently, and you’ll be duly rewarded.